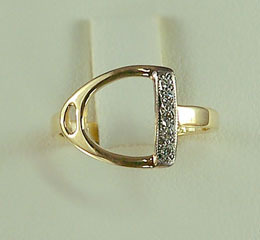 "English Stirrup Ring w/ Diamonds"
Ladies English Stirrup ring. Great for the English Horse enthusiast! Nice and elegant ladies English Stirrup ring set with diamonds down the iron. The diamond setting includes mill work and a two tone finish for a classy design. Dimensions: 11mm from top to bottom of iron with a 2mm wide shank. Available in 14kt yellow and 14kt white gold. Stirrup is set with .06ct of matching diamonds. Note: Use comments box below for a sizing request.